This hot chamber jazz session took place at Jazz at Chautauqua on September 16, 2011, and the estimable participants are James Dapogny, piano; Dan Levinson, clarinet and tenor sax; Andy Stein, violin; Frank Tate, string bass; John Von Ohlen, drums. Thanks to the gentlemen of the ensemble for creating and evoking music that will outlive the discourse that swirls around it. A few days later, I looked at the picture and noted that the marquee had turned Arnett into ARNET . . . and then, as they say in the UK, the penny dropped. Nearly forty years ago, I worked in a local movie theatre as a doorman / usher / all-around functionary in an ill-fitting black jacket. It wasn’t a career, but a way to put gas in my Volkswagen Beetle and to buy records at Record World. The minimum wage was $1.85 an hour. Once in a while I had the chance to make extra money “changing the marquee,” an annoying business involving ladders and sifting through piles of huge red plastic letters to spell out THE POSEIDON ADVENTURE or whatever the new feature was. 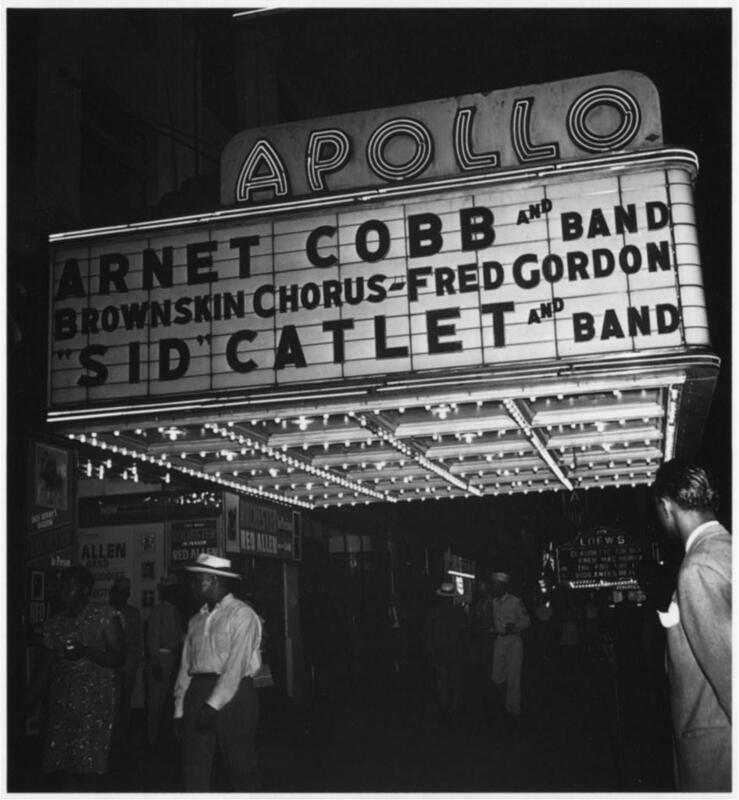 And it dawned on me that the people who changed the Apollo Theatre’s marquee for this week in summer 1947 were running low on the letter T — especially troubling because a marquee has at least two sides. It’s not a mystery that kept me up at night, but it’s today’s answer to an unasked question.